Thank goodness I slice my tomatoes before I eat them. When I sliced into this Roma, there was a little surprise in there. And not a good surprise! 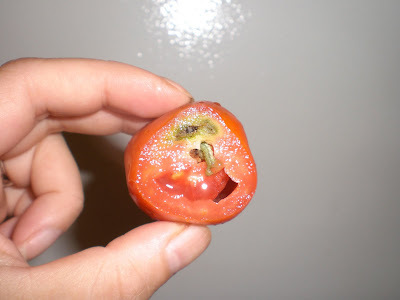 This little wormy sucker bore his way through the tomato and gorged himself on a tomato feast! Bigify the photo to see the little beast! Here's a side profile. I'm not sure what kind of worm or catepillar it is, but it grossed me out big time! Thank goodness I didn't accidently eat him. Ewww and ewww. And ewwwwwww again! What more can I say - you said it perfectly - ewwwwwwwwwwwwwwwwwww. Oh yah, almost forgot I got so busy ewwwwwwwing. Thanks for stopping by. I do love shooting pictures of my birds and critters. Some of them are trouble with a capital T but oh so very entertaining! I hate it when that happens. Good argument for not popping them into the mouth right off the vine! There was a tiny tiny hole on the bottom of the tomato but I couldn't see it really well. I'll look closer next time. 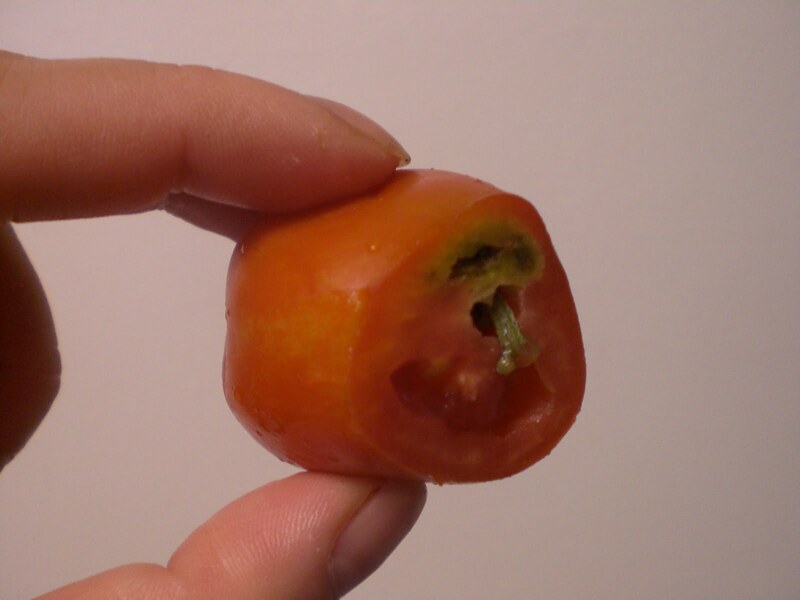 I'll never be able to pop a cherry tomato in my mouth again without cutting it open. I echo the ewwwwwwwww.